Remington R1 Enhanced Commander 45 for sale with cheap shipping and the lowest price online. Buy the Remington 1911 R1 Enhanced Commander .45 ACP 4.25 Inch 8 Rd Black # 96359 and get cheap, flat rate shipping with no hidden credit card fees and no handling charges at GrabAGun, the cheapest online gun store. Remington is a good brand name and Grab a Gun has great prices! I have the 5'' and it is a very good gun, shoots great, great trigger, and a very good finish on it. I spent several days researching for a new carry 1911 and felt this model provided the best value to price option. Never had a 1911 and this seemed like a quality firearm for a good price. I gotta a thing for 1911’s , don’t on a Remington . Love it , shot three hundred rounds with it , no hiccups or problems will alternate ccw with the Colt . Great 1911 , very accurate, great trigger. 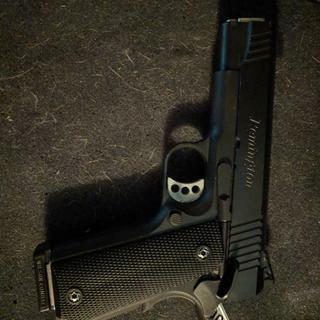 First off I researched the Remington 1911 and Grab a Gun I had some concerns buying a gun on line. Thankfully I was pleasantly surprised with both. Grab a Gun was a pleasure to work with. Grips we're ugly sights not what I prefer, but overall excellent value! I certainly would recommend this gun to any one. I shot it very little as it came from Remington and my only complaint was the sights. I hate fiber optic sights to begin with (personal preference) and the rear was just of poor quality and had limited adjustment. Otherwise this is an excellent value! Fit and finish is superior to most guns in this price range. I bought it solely as a base gun for a .45 Super build. It's now at @1000 rounds of .45 Super with no problems. Solid shooter , no issues after 300 rounds. This gun has been flawless so far. It shoots better than my S&W 1911 E series version. No problems whatsoever. Wow. That was easy. Find the perfect firearm for me. Then at the best price ever! Pick my favorite local dealer already in there system. Then BAM. It was mine after only a week! For the price, it's a very nice 1911. Right out of the box it matches up with some $1,000 1911's. I've got 500 rds through mine and not a glitch. After polishing a few parts, and a 20lb main spring, the trigger pull is 3-1/2 lbs. Fun to shoot. One of the best priced 1911's out there. Picked this gun up today. GAG was awesome! Fast service/shipment gun was received in perfect condition. 50 rounds through the gun and it has already became my favorite of the seven handguns I own, which include 2 Glocks, 2 Rugers, 1 S&W, and 1 Kimber. Was septic of Remington's quality and have stayed away over the last several years, however the more I researched the R1 enhanced the more I was convinced to buy it. GLAD I DID!!!! Super pleased with GAG and Remington!!! Picked this gun up today. GAG was awesome! Fast service/shipment gun was received in perfect condition. 50 rounds through the gun and it has already became my favorite of the seven handguns I own, which include 2 Glocks, 2 Rugers, 1 S&W, and 1 Kimber. 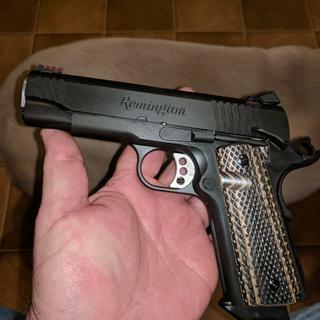 Was septic of Remington's quality and have stayed away over the last several years, however the more I researched the R1 enhanced the more I was convinced to buy it. GLAD I DID!!! !Super pleased with GAG and Remington!!! Happy with weapon and great service from GrabAGun. BLUFF: Happy with the gun and Grab A Guns service/shipping on a Remington 1911 R1 Enhanced Commander .45acp 4.25 Inch 8 Rd Black.Shipping is a GO. Item ordered on 5/28/17 (holiday weekend) and shipped on 6/6/17. All emails received as indicated on website.Packaging is a GO. Item received in UPS box. The box was not damaged and all content and paperwork was secured. The Remington 1911 came in a Remington green and black cardboard foam lined retail box. Weapon was placed in a plastic "paper" protector and each magazine in a plastic bag. All items have a cut out in the foam lining or the box to prevent movement or contact with other items in the box.Item condition is a GO.Weapon was oiled for protection inside and out. Finish was free of visual defects. Weapon and all components free from defects. No rust, no corrosion, no scratches noted, any fingerprints on oiled surface appeared to be from FFL handling upon receipt. Function is a GO.Weapon was fired straight from the box with no cleaning. Both magazines function flawlessly in the weapon. Weapon had zero malfunctions with 230 grain round nose. Slide lock, magazines and safety work in all aspects of cycling as they should. The factory set adjustable (elevation only) rear sight was 6 inches high and two inches right from point of aim at 8 yards, elevation was adjusted and new group (no rest used)was a two inch spread and two inches right of POA. Manual states not to use "plus p or +p rounds".Build quality at this price point $622 is a GO.Outside diameter of stainless Match Barrel is .581 inches. Inside Diameter of barrel bushing is .584 inches. No barrel wrench is needed to disassemble/assemble my firearm. Barrel lock up is very positive with no movement while pressing down on breech while locked into battery. Barrel link is firm and does not flop around while barrel is removed fits nice with slide stopSlide and frame has almost zero tool markings, the ones I could barely see were very minimal. Some rocking movement left to right, right to left on frame fit. Same as my Sig Sauer RCS commander, Tisas 5 inch, ATI Citadel 3 inch. Whereas my Kimber Grand Raptor Two and Colt custom 1991A1 have zero play in slide to frame fit. Frame fit is flush with slide at rear hammer area.Trigger is adjustable for take up and from factory there is about 1/16 inch before break and no over travel. I do not have a trigger pull gauge.Safety is extended and easy to operate, yet still firm and has a nice audible click and feel.Grips have a very aggressive checkering and look great with black hex head grip screws. Lower left side screw loosened just enough to make a clicking sound upon firing first 15 rounds. Grips are cut for ambi safety although no ambi safety is installed.Magazines drop free when released and load with a positive click. The bumper pads are marked with the Remington "R" .45 cal and sides are marked with 2-8 numbered holes. Magazine have a plastic, solid construction follower and a matt black finish. 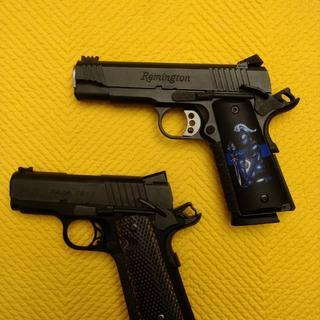 Remington Model 1911 R1 Enhanced is a high performance upgrade of America's pistol. The R1 Enhanced features a robust fiber-optic front sight, extended performance trigger adjustable for overtravel, adjustable rear sight and two 8-round magazines. Front and rear slide serrations, flat-checkered mainspring housing and custom grips promote sure handling. The Enhanced line of 1911 R1 fills a lot of needs with 9mm, threaded barrel, Crimson Trace Laser, stainless finish, and now double stack models.